Check my 2016 NECO Result - My NECO Result Checking Portal official website is www.mynecoexams.com where you can register all the your NECO exams, print your NECO timetable and check your NECO result without any form of stress. 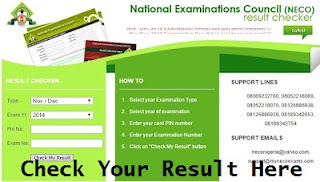 The website by designed the National Examination Council of Nigeria to enable students to be able to check their Senior Secondary Certificate Examination (External and Internal) June/July NECO result, Nov/Dec NECO result, the Junior School Certificate Examination (JSCE), and the National Common Entrance Examination (NCEE) and the Basic Education Certificate Examination (BECE). NECO News - This editorial is to notify you that the 2016 NECO results is not yet out. The June/July NECO result has not been released as at the time of writing this post. The result usually comes out by August/September every year so that students can see their results and prepare for their Jamb examination which is a required document that enables students to gain admission into any Federal University, State university, Private University, Polytechnics and College of Education of their choice. While waiting for the NECO result to be released and published on the NECO website, please be aware that you will need to buy the NECO scratch card at the cost of N300 Naira only from NECO headquarters and/or NECO zonal offices in Nigeria. you can also purchase the scratch card from any approved retail outlet which includes business centers and cyber cafes. before you can use the NECO scratch card, you will have to scratch of the coated portion of the card to reveal the digits on it. On the reverse side of the card, there is a serial number which is also required when checking the NECO result. You have to be sure the NECO scratch card has all these information before you pay for it. My NECO Result can be checked only on the official website using the NECO scratch card as explained above. However, we will explain details on how you can use the portal to check your NECO result even if the site is flooded by traffic when it is released. To be able to check your result easily, it is advised that you visit the website at night with your computer or mobile phone when others are fast asleep to that the webpage can open faster. Note: NECO Result Scratch Card is now N300 only.